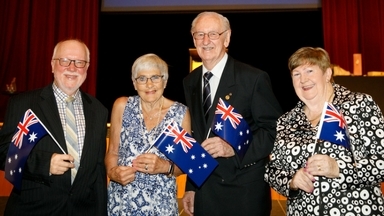 l-r: Walter Scharley, Vivienne Harkness, Bernie Smith and Anne Brown. Vivienne joined the Boroondara Stroke Support Group (BSSG) in 2011 after her husband Peter suffered a stroke. As a devoted carer for her husband she recognised that stroke survivors could benefit greatly from the services and support provided by BSSG. Since Vivienne became BSSG President, there has been a significant expansion of support activities for stroke survivors, their carers, families and friends. Vivienne, together with other members of the BSSG, was fundamental in establishing the Boroondara Community Stroke Hub where people meet to enjoy various activities and support each other. The hub model has been picked up by the Stroke Association of Victoria and is being rolled out across the state. Vivienne also started the Sing for Recovery Choir which visits stroke wards at five major hospitals around Melbourne, singing to stroke patients and bringing hope and comfort to survivors in the early days following their stroke. Before joining the BSSG, Vivienne was a community liaison officer for Breast Cancer Network Australia. She was also responsible for launching Red Nose Day in Australia. Over the past seven years, retired builder Bernie Smith has been the driving force behind the development of the new North Balwyn Men’s Shed. Bernie headed up a committee to work with Council to find a suitable site for a men’s shed in the North Balwyn area and together with Council designed the new community facility. Bernie’s commitment to the project was driven by his strong belief that North Balwyn, a community with a large population of retired and semi-retired men, would benefit from a men’s shed to bring people together to socialise and make new connections, as well as learn and practice skills. Since its launch in September 2017, Bernie has supervised the workshop’s activities each Monday and Thursday. For the past seven years, Anne has volunteered her professional skills in administration and records management to support Guide Dogs Victoria to undertake large complex projects, including setting up a database for all bequests and transitioning all client files from paper to online. Anne spends four hours each day volunteering in the community. In addition to her work with Guide Dogs Victoria, she dedicates a significant amount of time to the Boroondara Cares Foundation and the Yarra Bend Rotary Club where Anne has held various roles, including President, Secretary, Treasurer and Youth Services Director. Since 2009, Walter has volunteered his time and professional skills supporting a number of Neighbourhood Houses in Boroondara. As Treasurer and committee member at Surrey Hills Neighbourhood Centre, Walter is instrumental in providing effective governance and helping set strategic direction. Walter has also been involved in the Surrey Hills Music Festival’s Steering Committee and supported other local Neighbourhood Houses to establish new accounting systems and programs.